If you walk through the door to our place, don’t be surprised at the sweet aroma of freshly cut wood greeting you! Each and every frame is crafted exclusively in our shop, situated at the same location as our corporate office in Carrollton, TX. CSD is a professional framing company dedicated to beautiful custom framing. We handle all operations in-house. Our high-quality material shows the pride we put into framing. Pick up your piece or have it shipped. We are a work family with the expertise to get each and every job done perfectly to our customer’s specifications. Our custom framing quotes are always free. From photo frames to shadow box display cases, we handle it all. 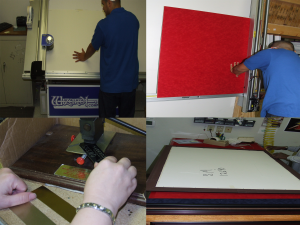 When it comes to custom framing, it’s all about making our customs happy.